One aspect of my life that I don’t talk about very often is the fact that I am married to a pastor. My shepherd at church is also my shepherd at home. Not to be confused with my infant baby, Shepherd. You can tell him apart from my husband/pastor shepherd because he wears onesies and his name has a capital “s”. 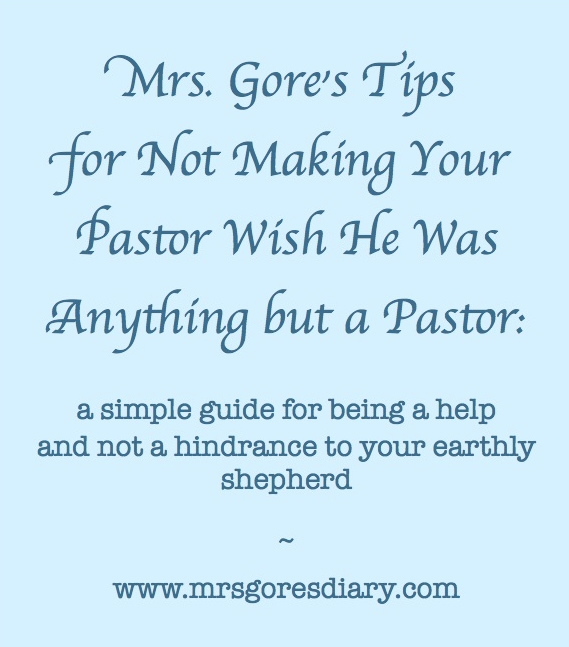 Anyhow, this not only makes me the heralded “pastor’s wife”, it makes me an expert in all things pastorly. And since I am both a full-time layperson/congregant and married to a full-time person of the cloth, I thought I would merge my two worlds today and give some pointers on how people like us (the congregation) can be a help and not a hindrance to people like us (the minister and his wife and family). As usual, I can only talk about things like this because our church is the totes awesomest. I give you my word, there is no hidden agenda or lurking jabs in the words that I shall henceforth be sharing. Or in the words that I heretofore shared. 1. Obviously, don’t be a poo-poo head. 2. Guard your little words. As your God-appointed leaders, your pastor spends his week praying and, if you’re lucky, maybe even fasting, with you in mind, expecting the Lord to do something great in your life; thus, imagine how it must deflate him when he sees you at church and says “Good morning! How are you?” and your response is “It’s cold in here” or “Your microphone is too loud.” Um, ouch. Try instead to tell him what you appreciate about him or how the Lord used the sermon to impact you. He truly wants to hear about it. Then you can tell him you’re cold. In a nice way, of course (see point #1). 3. Likewise, guard your big words. Speaking of “um, ouch”, I’ve taken note over my lifetime in church of how folks tend to speak more bluntly to pastors than they do others. As a full-time SAHM/homeschooler, I can’t imagine what it would feel like if someone walked into my home and started picking apart my realm, not only finding fault with the things that make up my entire life, but sharing my faults openly with others, all before giving me pointers on how to do my job better. It would be heartbreaking. Guard your tongues, ye brutal and loose-tongued opiners, and, not to be redundant, but…see point #1. 4. Give your pastor plenty of family time. Our church is the BEST at this. We are five years into our ministry here, and never once have I felt that I am competing with the church for my husband’s attention. Granted, he has set firm guidelines in this area, but our church has also done its part, giving him freedom to come home when he chooses, to keep flexible office hours, and to arrive and depart from church with his family rather than in separate vehicles (meaning, no late-night meetings, etc.). A church that competes with, rather than nurtures, their pastor’s life at home fatally damages his potential for fulfilling his biblical call. Tsk, tsk, tsk. That’s worse than being a you-know-what (see point #1). 5. Incline your ear and follow your leader. Now it is the job of the congregation, myself included, to follow. The most encouraging church members are the ones who really listen and do the things their pastor asks them to do (obviously, this includes neither sinning nor drinking any kind of poisoned fruit punch). 6. Think about your particular gifts and use them to minister to your minister. It has been a joy for me to watch our congregation encourage our family, in all kinds of different ways. Their gifts literally keep us going. Whether it is the deacon who makes hospital visits to give our pastors plenty of study time, or the older women who tidy up my husband’s office, or the young mom who brings us food, or the widow who frequently sends us encouragement, or the couple who constantly prays for us, or the man who mows our yard, the love and generosity of our church family makes the way so much easier for us. Do the same for your pastor, and I’m pretty sure you’ll get an in-ground swimming pool in heaven. 7. Work hard to keep your pastor safe. You can do this in so many ways. Pray for him. Give him plenty of rest. Pray for him. Protect him from she-devils with wicked intentions. Pray for him. Be his visitation buddy. In other words, be his watchdog and his mother hen. Taking care of your pastor helps ensure he will be equipped to take care of you. Oh and don’t forget to pray for him. 8. Give him time and room to grow. Although it is imperative that he meets the requirements that scripture lays out for his eldership, your pastor is being sanctified just like you are. Remember, pastors are people, too. And people are poo-poo heads sinners. 9. Give him time and room to preach. It has become a token joke in today’s church culture to make references to the length of the pastor’s sermon, and although this is usually in good fun, I can imagine that it could easily turn harmful. Imagine, for a minute, the pressure of knowing that the God of the universe was watching to make sure you said everything you were supposed to say. And then imagine looking out across of sea (or a small pond) of people who were tapping their feet and checking their wristwatches, expecting you to accomplish that daunting task in twenty to thirty minutes per week. Cherish the pastor who is more afraid of God than he is of you, and give him the freedom to do his job and do it thoroughly and “with joy” (see Hebrews 13 below). 10. View your pastor and his family as a team. This advice is more practical than it is biblical, but I appreciate it so much that, when our church members pray aloud for my husband, they pray for me and our children, too. I also personally love it when women include me in messages they send to my husband or seek us both out for advice; it is in no way necessary (because I read all his messages anyway), but it is a very cool thing to do, and it strengthens our family unit, which, again, is only for the good of the church. Many dole out big bucks for their doctors, dentists, accountants and personal trainers without question, but then expect their pastor and his family to live like paupers. you can help by making sure he doesn’t have to worry during the week about how he is going to afford some cornbread to go with his beans. (Kudos to our church family for our generous salary and for a yearly cost-of-living increase!). 12. Include him in your decision-making. after their decision is made. 13. Make the way easy for him by submitting and not grumbling. Your pastor will answer to God for how he led you. You will answer (also to God) for how you followed. ‘Tis a very freeing and simple arrangement, is it not? I wish I had realized that sooner. 14. Keep poo-poo heads accountable. Lastly (but almost certainly not leastly), if you hear someone speaking ill of your shepherd, either gently rebuke them or change the route of the conversation. Their words will not only harm your pastor, they could harm your own ears, planting seeds of discord in your heart that could lead to a root of bitterness. Which could turn you into a…well, see point #1. As with any list of advice or etiquette, I am sure these pointers are far from comprehensive, but I hope they provide some helpful insight. How I could have used this list when I was younger! If I could go back and be a better sheep for my former pastors, I most certainly would. Consider this my public apology, for when I typed these words and revisited old memories, I felt sheepish, indeed. Baaa. I also deeply apologize for how many times I said or referenced “poo-poo” in this blog post. Mrs. Gore’s comment policy: all comments are read and appreciated, but only those that are edifying and do not lead to lengthy internet discussion are approved. I love it! What a fun and humorous approach to a very serious subject. May the Lord continue to richly bless your ministry in the church that you serve, as well as your congregation. Oh MG, I simply love you to pieces! May God Bless give you a perfectly Blessed day! As a PK (preacher’s kid) and now a PW (preacher’s wife), I appreciate the wisdom and love poured out in this blog. Thank you for championing the cause of the pastor and his family. I love the humor and honesty in your writing. Teehee! No need for poo-poo apologies. How many times do we deal with poo in a day? 🙂 Thanks for sharing this list. Excellent suggestions, done as always with your wonderful blend of humor and truth! I have personally witnessed some distressing behaviors done directly and indirectly at pastors, and your comments have helped me to become even more supportive of our wonderful pastor and his family. Thank you for your words! I love reading your blog! Being in the ministry but not a pastor’s wife, we feel the same way in so many areas, but people expect us to take the complaints they are not courageous enough to tell the pastor and then tattletale on us on top of it! So agreed, we need less of that and more encouragement!! 🙂 And much less of #1!